Hop on a Segway and tour the town in a cool way. Enjoy the stories and secrets in Austin riding through the downtown city streets on your Segway for 2.5 hours; you’ll glide to the coolest parts of town including a visit to the Congress Avenue Bat Bridge at dusk. Tours start with rider orientation and training. You will get some help fitting your helmet then off we go for an exciting tour. Feel the wind in your hair while we cruise to the State Capital of Texas, the Driskill and to other hot spots around town. Not to worry, your guide will entertain you at several stops while you get the best pics. 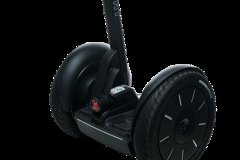 Segways are capable of 12.5 mph, tour guides like to keep speeds at 8-11.5 mph to keep everyone comfortable, this allows everyone to have fun in a safe way. Congress Ave is home to the largest urban colony of bats in North America, you will get to see where they live and a quick look when the depart at dusk.